The cost of the class is $75. per person. 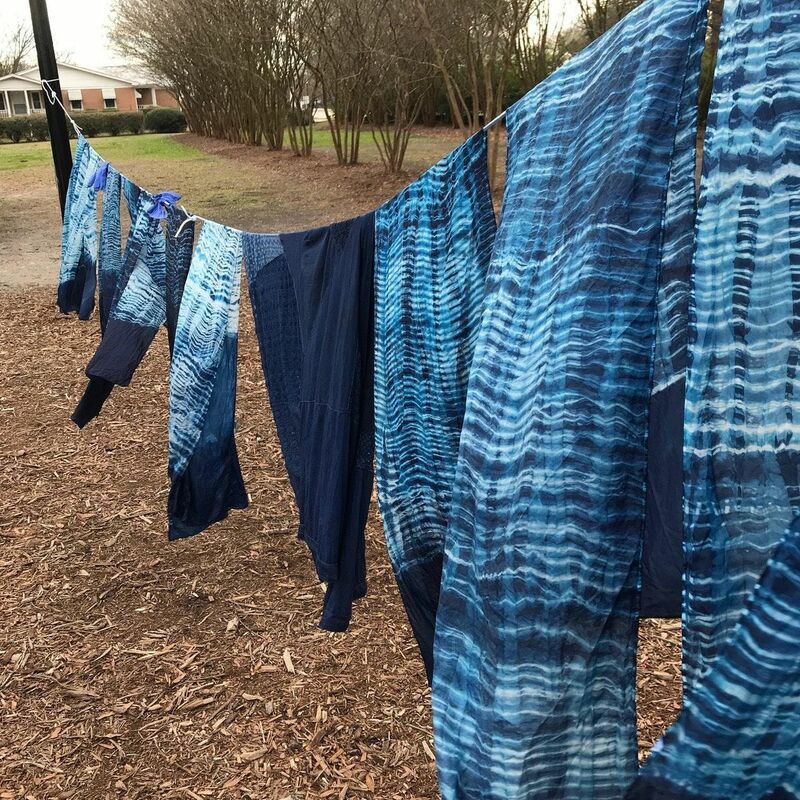 You will learn the history of indigo, how to create your own dye tank, and dye a scarf with the arashi shibori technique to take home with you. All classes require a waiver signed at registration and before class arrival. 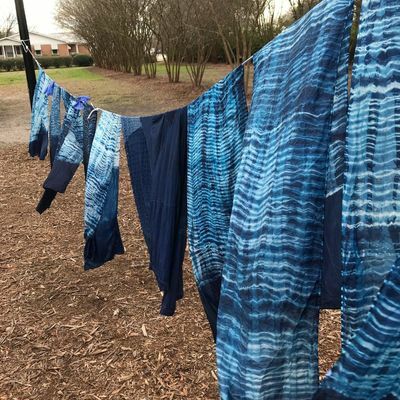 Caroline Harper launched Chi Design Indigo, LLC in 2014 to produce a line of natural fiber textiles for home décor and fashion accessories, all hand-dyed with natural indigo she grows and processes in South Carolina. 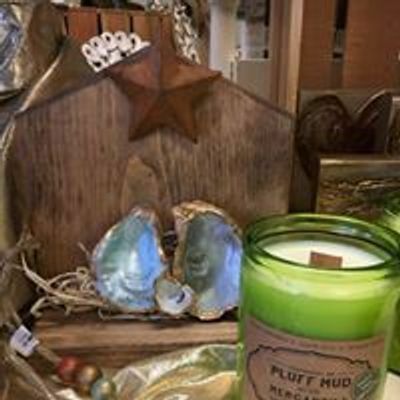 Her products are sold at annual craft shows, on-line through her website, Etsy, and small boutiques and galleries. Caroline traveled to Japan to study Shibori and other ancient resist-dyeing techniques and shares her passion for indigo and other natural dyes by hosting workshops tailored to students of various skill levels. Her mission is to revive the culture of indigo in South Carolina and provide indigo education and production experiences. 1. Age Requirements - Our classes are geared towards adults or adults with supervised children. The parent assumes full responsibility for the child's supervision and a liability waiver must be signed for each parent and for the child. Our workshops may include chemicals and or high temperatures. Our customers safety and enjoyable experience are very important to us. We do offer custom dates and special groups, so please contact us if you have any questions about these options. 2. Starting on Time - In the event you are running late, please let us know...we desire to respect the time of all the class members by starting as scheduled. Allow yourself a little extra time for any shopping, to get settled and acquainted before the class. We start the classes promptly, and they usually are from 1 1/2 - 2 hours long. If for some reason you are going to be over 15 minutes late, we ask that you reschedule for another date. 3. Cancellations - We offer a small group setting and intimate atmosphere for our classes, therefore our classes sell out quickly. If you are unable to attend we ask that you notify us by phone at 843-872-6022 at least one week in advance. In that instance you will be able to reschedule for an alternate scheduled date, or we will offer you a store credit. We understand "life happens" and you may not have advanced notice to cancel. Please let us know via phone as promptly as possible so we may notify customers on our waiting list that would like to attend. Much preparation has taken place prior to your arrival and we have held the spot for you, so if you do not notify us in advance, and do not attend the class, no refund will be issued. If you contact us within 48 hours of your class we will work with you on rescheduling for another available event date. In the event this is a custom date or we are not notified by phone within 48 hours of the class time that you will not be able to attend, the fee is not refundable. Private Classes: If you are interested in a private group class with custom times, younger age group, or additional instruction, please contact us via email or phone to discuss these options. Attire - Dress comfortable and casual. You will be making candles with melted wax and sometimes spills happen. ;-) We suggest wearing something that you wont mind getting wax on - just in case. We do offer aprons for your use if you like. All instruction, materials and supplies are included with your class.The cost of the class is $48 plus a small additional fee charged by Eventbrite. We are excited about having you join us in our store for an evening of fun, crafting, and fellowship! We will offer water. Feel free to bring your own non-alcoholic beverage. Thank you for joining us.